I was soooo excited to get my assignment for The Secret Recipe Club this month. You see, I got assigned to someone I have grown VERY close to in the past few months. She is a fellow Allrecipes Allstar and a fantastic friend! I looked through her blog, as I have so many times before, trying to find JUST THE RIGHT RECIPE!! I wanted it to be special. I think I had contemplated and bookmarked about 20 recipes to try...no lie. I couldn't choose! But then I saw three fully ripe bananas sitting in the fruit bowl and I knew what I was going to make...her Maple Walnut Banana Bread. Shelby's blog is full of all kinds of great recipes from indulgent to diet friendly. A few I have bookmarked to try later is her ever famous Chicken Baseballs (perfect recipe to celebrate any game now that baseball season is here! ), her Apricot Quinoa Breakfast Cookies (yup, this one will remain on my "must make" list), and her Mom's Cheese Ball (I am a sucker for a good cheese ball!). 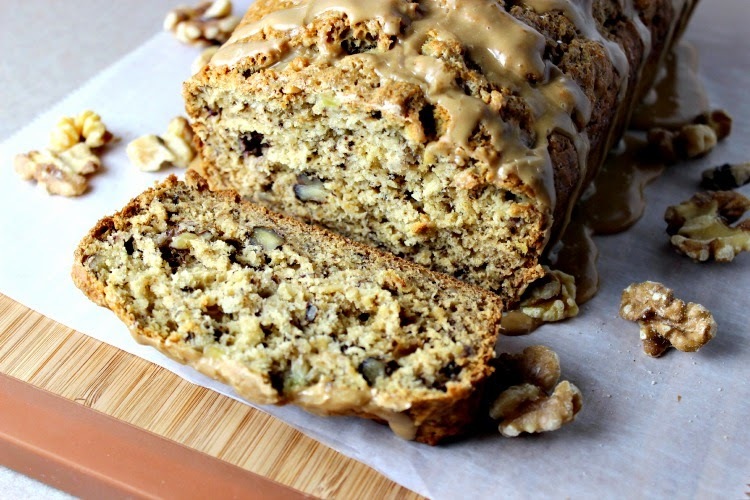 But today, we are going to talk about her Maple Walnut Banana Bread! Yum! This recipe appealed to me for several reasons. I had those bananas that needed using up, I love maple, and the only real sugar ingredient in the bread itself is pure maple syrup. I tweaked the recipe just a tad. Shelby said she thought the maple flavor overpowered the banana flavor, so I used all three bananas instead of two. I also decided to put the walnuts INTO the bread instead of on the top and I added a 1/2 tsp. salt to the batter to help balance the sweet. I omitted the sugar topping and glazed the bread with some maple flavored glaze. I replaced the butter with canola oil. With all the changes I made, I still had a pretty incredible tasting quick bread. 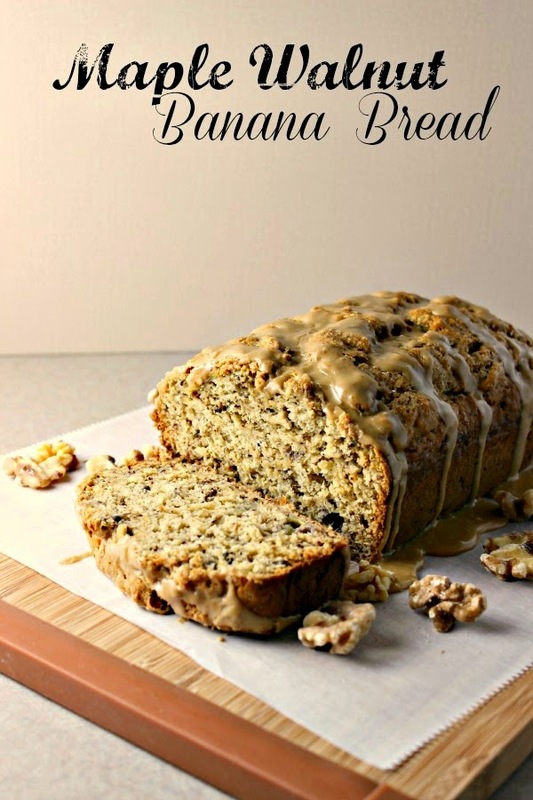 Whether you make my version or Shelby's version...if you like maple, you'll love this twist on traditional banana bread! I cannot even begin to describe how incredible your house will smell as this bakes up. Preheat oven to 350 degrees F. Spray a 9" loaf pan with cooking spray. In a large bowl, combine the flour, baking soda, baking powder and salt. Set aside. In a small bowl, combine the mashed bananas, maple syrup, oil, maple extract and milk. Add the wet ingredients to the dry ingredients and mix until JUST combined. Add in the walnuts and spread batter into the prepared loaf pan. Bake for 45-50 minutes, or until toothpick inserted into center comes out clean. Cool on wire rack. To make glaze: Combine the powdered sugar with maple extract and enough milk to make smooth. Pour over banana bread. That is a beautiful take on banana bread. Yummm. On a different note, I was assigned your blog this month and I loved the Bursting Berry muffins that I tried out. Thanks for the inspiration. Thank you Trisha! I was just over at your blog and left you a comment. Loved your version of the muffins! How fun!! The bread looks amazing! I love the addition of the maple - yummmm! Now thats some kicked up bread! What a great pick! Yum! BTW- I made your tuna casserole for Josh yesterday and he LOVED it- thank you! Renee, how this happened is SO funny! There is another person in SRC who I talk to on a regular basis. We have been in SRC together since the beginning and I have never gotten her once yet! (Katrina @Baking and Boys). Glad you had a good time and your a little sneak. ha ha. I love Katrina's blog too. Hope I get assigned to it one day! thank you Mary! We enjoyed it! G'day! This looks delicious Renee and wish I could come through the screen to try a slice now with my coffee! The maple in this takes it up several notches. I love banana pancakes so I know this is a great combination. The maple was definitely a nice change up! Wow, this sounds so yummy and I'm not even a big banana fan!! You know, me either. But I did enjoy this bread. Just enough maple to make it interesting. Oh my...this looks irresistible Renee! Wow, does this look good. I'm a huge maple fan (go figure, growing up in Vermont) and this bread looks delicious.